MARAD study shows renewable diesel fuel reduces emissions without impacting engine performance. The Maritime Administration (MARAD) has recently completed tests of renewable biofuel technology onboard the training ship State of Michigan. The project was part of a MARAD initiative to conduct “at sea” tests of advanced renewable fuels and assess its impact on the ship’s engine. The tests compared operational, vibration and air emission differences between regular ultralow sulfur diesel (ULSD) fuel and a 76/33 blend of ULSD and Amyris Renewable Diesel (ARD) fuel, which is derived from sugar. The study determined that ARD reduced air emissions without any significant difference in engine performance. The full study (summarized below) can be read at http://www.marad.dot.gov/documents/Sugar-Based_Renewable_Diesel_Testing_Final_Report_August_30_2013.pdf. In carrying out its statutory mission to promote the U.S. merchant marine, the Maritime Administration (MARAD) strives to stimulate development of affordable, sustainable and environmentally sound marine propulsion systems. Among other initiatives, MARAD is evaluating the use of renewable diesel fuels in commercial vessels. This study compares the operational and performance differences in a test vessel’s use of Ultra Low Sulfur Diesel (ULSD) versus a 67/33 blend of USLD and Amyris Renewable Diesel (ARD), which is derived from sugar. No significant differences were found between the test vessel’s use of neat ULSD and the blend in terms of engine performance, fuel economy, air emissions, engine vibration, underwater radiated noise, and effect on the engine itself. The test also found that after seven months storage of the blended fuel at the test location there was no appreciable change in fuel composition or biological contamination. The test platform selected for this evaluation was the Training Ship (T/S) State of Michigan, which is owned by MARAD and operated by the Great Lakes Maritime Academy (GLMA) in Traverse City, Michigan. 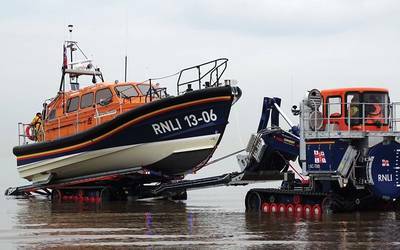 The vessel is a diesel-electric drive vessel with four propulsion diesel generators and two propulsion motors. A combination of underway and pierside testing was accomplished over a two week period in September 2012. The ARD was originally blended with ULSD to make a 50/50 blend by volume of blend test fuel. A shipboard valve malfunction, however, caused additional ULSD to be mixed with the blend test fuel changing the blend percentage to 67 percent ULSD and 33 percent ARD. The report discusses the details of the operational, emission, machinery vibration and underwater noise tests, and evaluation of the material condition of the engine components pre- and post-test. Performance and emissions data were collected both underway and pierside. The vessel has diesel-electric propulsion with four caterpillar D-398 compression ignition engines; one of these diesel generator engines was selected as the test engine. The diesel generators set provides power for both of the propulsion motors propelling the ship and the electrical power for the hotel loads. The ULSD was blended with the neat ARD fuel in a 50/50-by-volume in the field at a local fuel company. The 50/50 blend fuel was then loaded on the ship, however, the tank had ULSD fuel that had accidently leaked into the tank as noted above. The net result of this accidental mixing was a final test blend of 67/33 ULSD/ARD. ULSD from the same batch of fuel was also loaded and used for the baseline ULSD emission, vibration, and underwater noise tests and to run the other shipboard generator sets for the duration of the test. 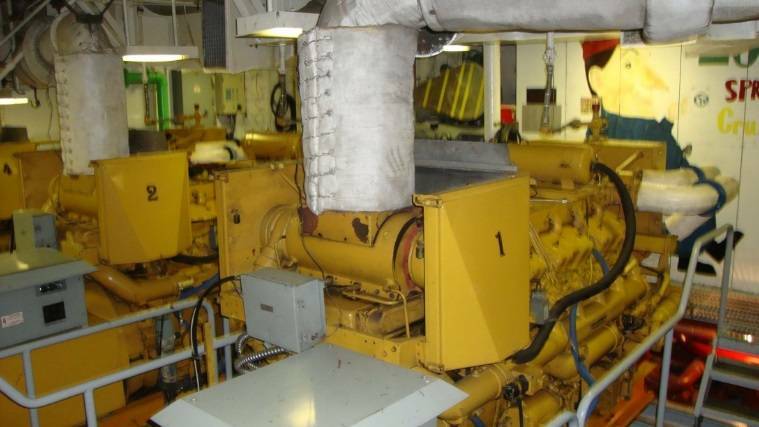 The Number 4 Ship Service Diesel Generator (SSDG #4) was used for the baseline and blend fuel exhaust emission testing and also for the remainder of the testing. Modifications were made to the exhaust stack to accommodate the exhaust emissions test equipment. The Number 4 SSDG was tested for over 125 hours with over 2,500 gallons of the 67/33 blend of ULSD/ARD. Some minor modifications were required to the engine to permit insertion of test instrumentation; however, all test equipment was removed, and the engine was restored to original condition upon completion of the test. Exhaust emission testing was performed while underway on Lake Michigan using the baseline ULSD and the blend of ULSD/ARD on the same day. The same test profile was run using both fuels. Emission testing was conducted using the ISO 8178 (D2) test cycle and was performed by University of California – Riverside (UCR). The same diesel generator engine, SSDG #4 was used for both fuels. The goal of the project was to measure the changes brought about by switching from a ULSD to a 67/33 blend of ULSD/ARD. UCR concluded through statistical analysis of the test results that the emissions and fuel economy are essentially the same for the ULSD and the 67/33 blend of ULSD/ARD. During emission testing an equipment vibration survey was accomplished on SSDG #4 for both fuels. This testing was performed to determine whether any vibration differences exist for equipment operating on ULSD and the blend test fuel. Naval Surface Warfare Center (NSWC), Carderock Division, Code 984 was contract ed to instrument and measure vibration of the SSDG #1, SSDG #3, and SSDG #4 as well as the propulsion motor and propulsion shaft during the tests. Testing of SSDG #1 and SSDG #3 was performed to mimic the test points of the emission tests on SSDG #4. Vibration data was also collected during the underwater radiated noise testing performance. NSWC stated that after examining this data, the results show no appreciable difference in vibration between the two fuels. Underwater radiated noise testing was performed in accordance with ISO/CD 16554 over a period of two days. This test required a series of test points and on both port and starboard passes in a test range with an anchored support ship provided by NOAA. The Navy’s Detachment Atlantic Test and Evaluation Center (AUTEC) of the Naval Undersea Warfare Center Division, Newport was contracted and conducted radiated noise signature measurement of the test vessel. AUTEC concluded that at a minimum, operation of SSDGs on alternative fuel has no adverse effect on the T/S State of Michigan radiated noise signature. The remaining operational testing consisted of underway and pierside test runs conducted to observe the shipboard power plant operation and accumulate data for the remaining engine hours given the amount of available test fuel. Prior to the testing, the engine internal conditions were assessed using a combination of visual inspection and physical testing. At the conclusion of the testing period, an engine inspection was performed and compared to the initial pre-test engine inspection. Both inspections were performed by the same Caterpillar Service Representative to ensure consistent evaluation of the material condition of the components. The service representative concluded that the effects of the renewable blend fuel on the engine were similar to ULSD. Finally, the remainder of the blend test fuel was moved to a double bottom storage tank on board the vessel for the winter lay-up in late September 2012 to test long-term fuel storage stability. Samples were taken as the fuel was moved to the storage tank and then in April 2013. Fuel analysis and biological contamination testing performed on the samples at the start and conclusion of the test were the same. MARAD has concluded as a result of this testing that the 67/33 blend of ULSD/ARD, as blended for this test, appears to be an acceptable drop-in replacement fuel for the ULSD used on the T/S State of Michigan as well as other commercial vessels having a similar power plant. The testing successfully demonstrated all facets of drop-in fuel performance, from fuel husbandry (loading, transferring, and supply to the engine), to comparable exhaust emission performance with no adverse equipment vibration or underwater noise impact.